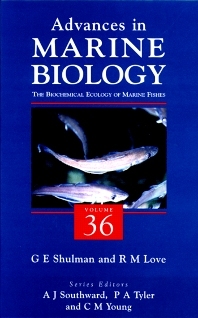 This volume is dedicated to an in-depth discussion of the biochemical ecology of marine fishes. The authors review fish biology with regard to the environment and the world's fisheries. They show how fish can be assessed for harvesting at the best time in their life cycles and in the correct condition for marketing, freezing, and preserving. In this context, they include coverage of adaptations of fish to the environment, life cycles, and metabolism. This volume will be of interest to biochemists, marine ecologists, and fishery scientists. Advances in Marine Biology has always offered marine biologists an in-depth and up-to-date review on a variety of topics. As well as many volumes that provide a selection of important topics, the series also includes thematic volumes that examine a particular field in detail. Marine biologists, fisheries scientists, and ecologists--postgraduates and researchers.